It’s been a good couple of years for handheld computer enthusiasts. 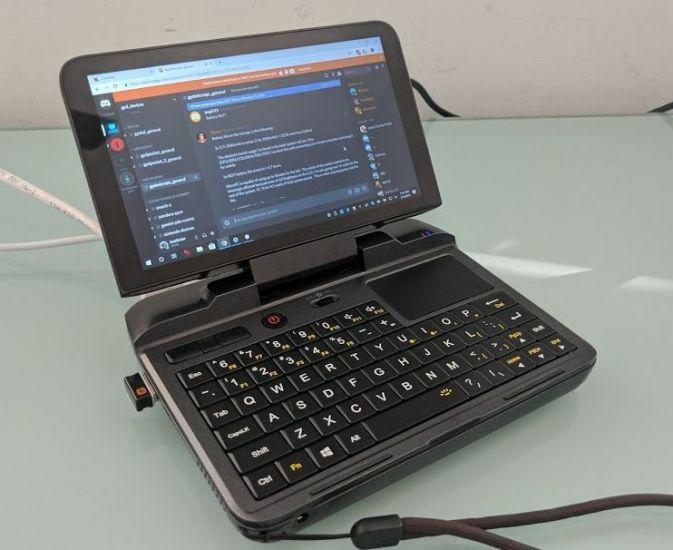 Companies like GPD, One Netbook, and TopJoy have been cranking out Windows computers with screen sizes between 5.5 inches and 8 inches and for the most part each one seems better than the lat in one way or another. 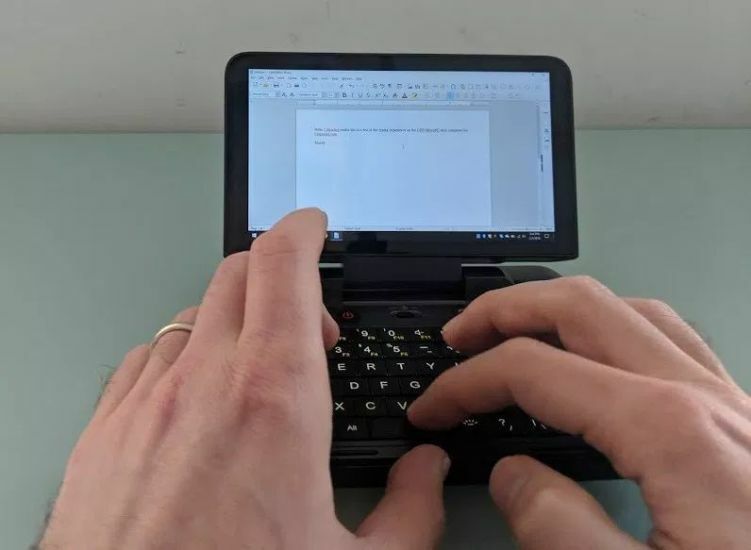 Now GPD’s fifth tiny Windows computer is available for pre-order through a crowdfunding campaign. 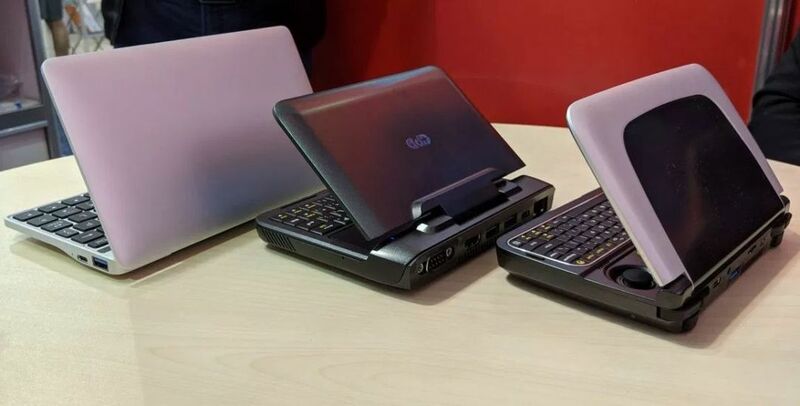 It’s called the GPD MicroPC and it’s… honestly a bit weird. 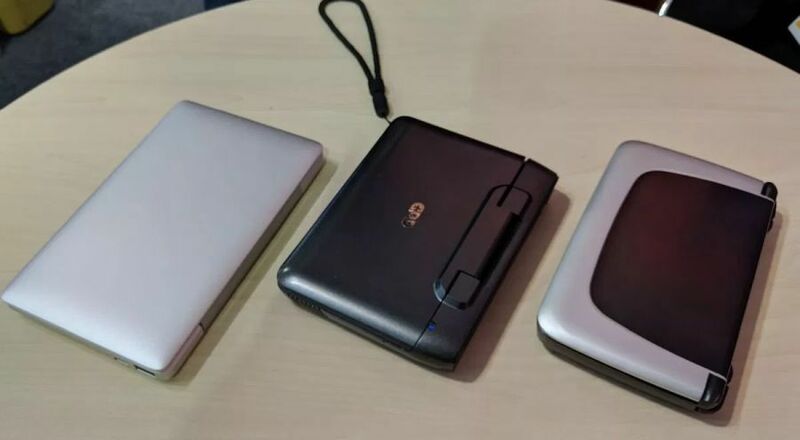 The GPD MicroPC has more full-sized ports than you’d expect to find on a device that’s small enough to fold up and slide into a pocket (if you have fairly large pockets). 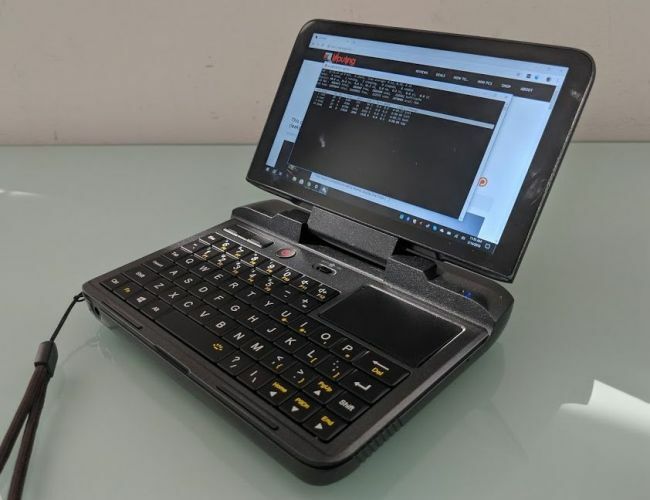 That makes it a versatile machine that could be appealing to network administrators and other folks that need to troubleshoot gear in the field, but who don’t want to carry around a big, heavy laptop. It’s the company’s most affordable mini PC to date. 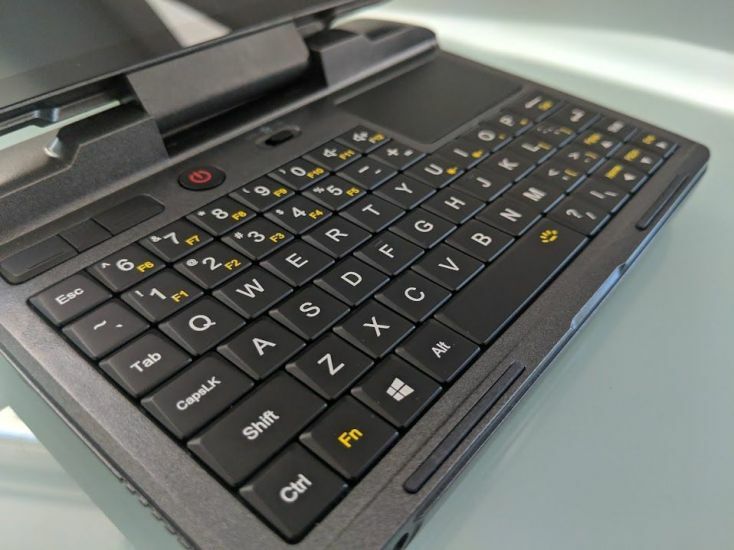 GPD plans to sell it for $399 later this year, but backers of the company’s Indiegogo campaign can reserve one for as little as $299. And that could make it appealing to folks who don’t need some of the computer’s features (like the serial port on the back). Update: The price is now $314 for new backers of the crowdfunding campaign — but the MicroPC will also now ship with 50-percent more RAM (6GB instead of 4GB). 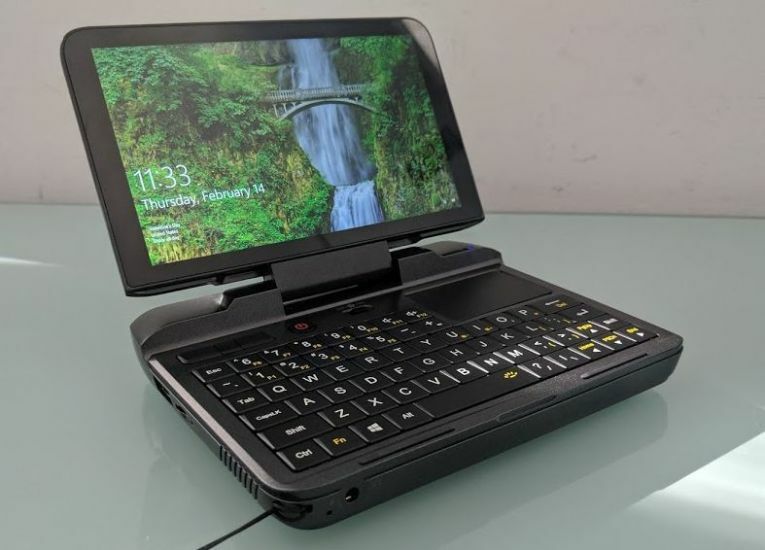 But it also has a plastic body, a relatively slow processor, and the GPD MicroPC lacks a touchscreen display. The thumb keyboard is also not something I’d want to spend a lot of time using. It’s good enough for entering small amounts of text, but if I were instant messaging a friend or writing a term paper, I’d probably rather use a full-sized keyboard… or even my touchscreen phone, quite honestly. 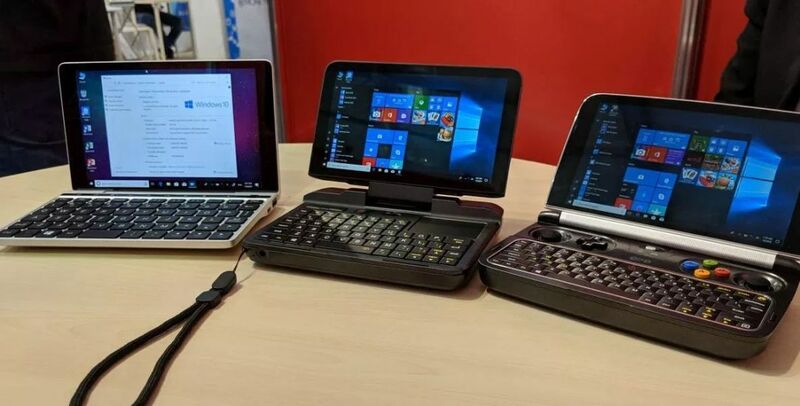 The GPD MicroPC isn’t going to appeal to everyone. 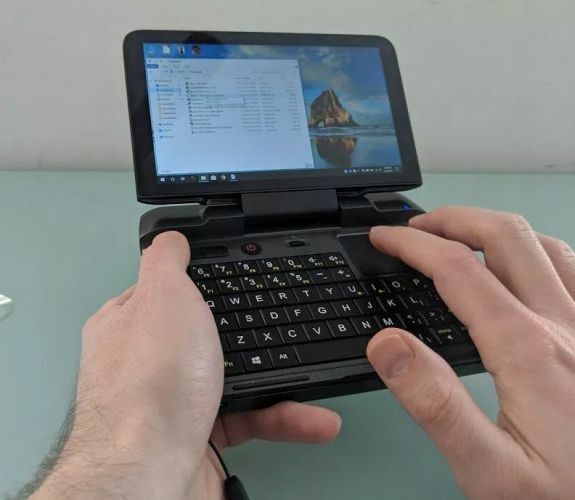 But for enthusiasts of handheld computers, it’s a unique option that combines an affordable price point with a heck of a lot of functionality. GPD sent me a pre-release demo unit to test for this preview, and I’ve been using it on and off for the last month. 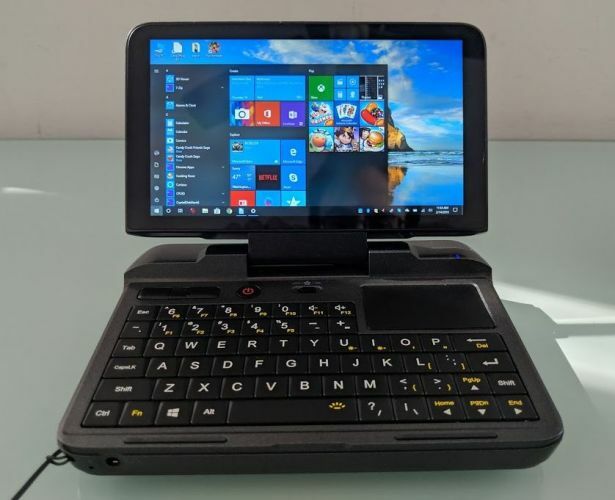 The GPD MicroPC measures 6″ x 4.4″ x 0.9″ when closed, and when you open it up you’ll see a 6 inch, 1280 x 720 pixel display with Corning Gorilla Glass 4 for scratch resistance. The screen packs 245 pixels per inch and has 178 degree viewing angles. Weighing about a pound, the MicroPC is a bit larger and heavier than a typical smartphone. 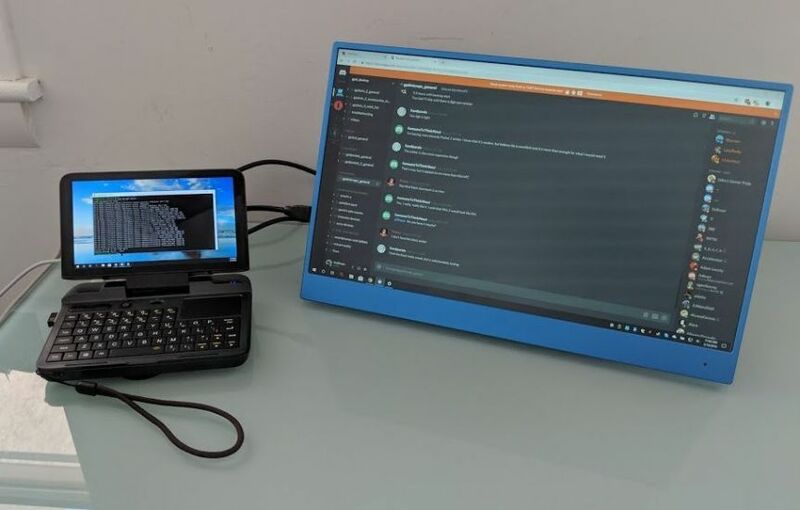 But it’s still pretty darn small for full-fledged Windows 10 PC with an x86 processor and enough ports that you’ll rarely need to plug in a USB hub to get work done. 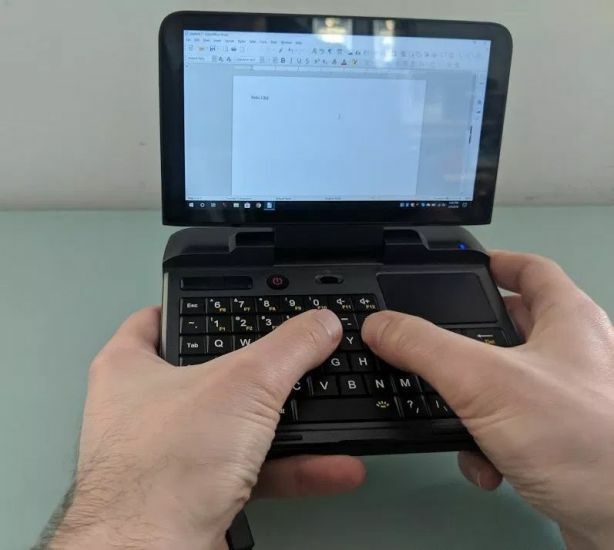 The computer is very much designed to be held in two hands, and the keyboard is small enough that you should be able to reach your thumbs across it to type. 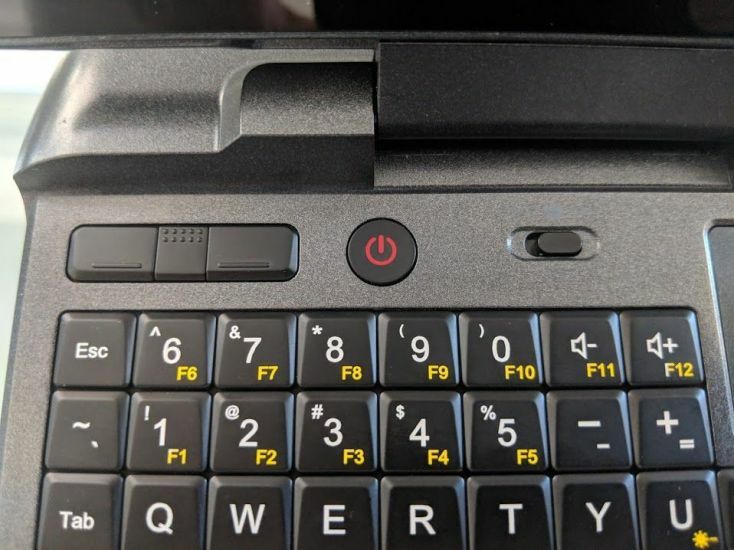 There’s also a small touchpad above the right section of the keyboard that you can use for navigation. It supports multi-touch input so you can use multi-finger gestures for scrolling, right-clicking, and other actions, but there are also left and right buttons above the left side of the keyboard if you’d prefer not to lift your hand. 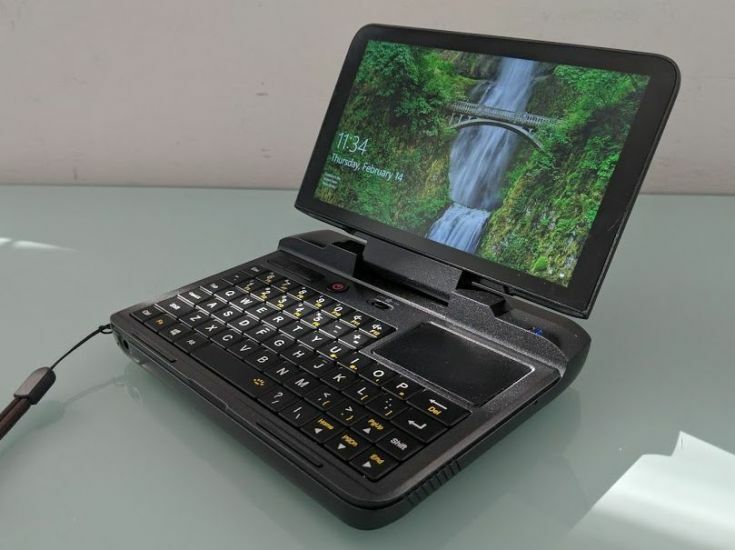 GPD did include backlit keys, which is a nice touch — especially for folks who may want to use this computer outdoors at night, in a dark server room, or any other place that a technician on-call might want to carry a computer. 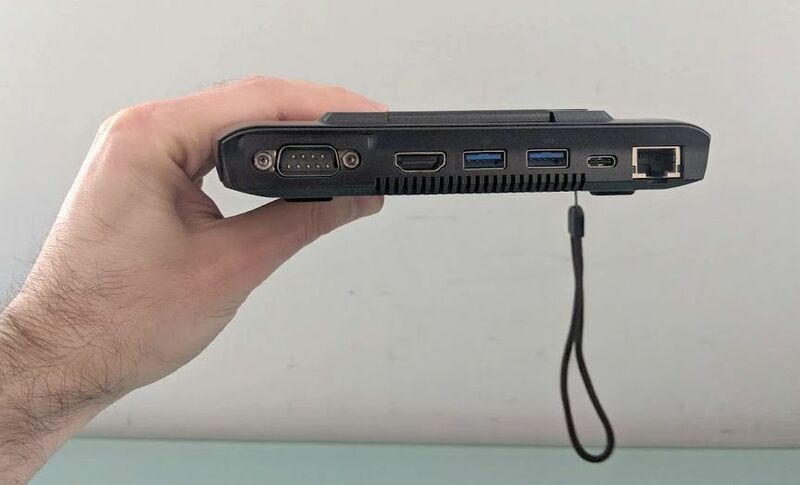 I keep thinking that’s probably the ideal customer for this sort of device — someone who doesn’t want to leave home without a computer, but who wants something compact that’s easier to carry than a traditional laptop. One thing this computer does not have is a camera. 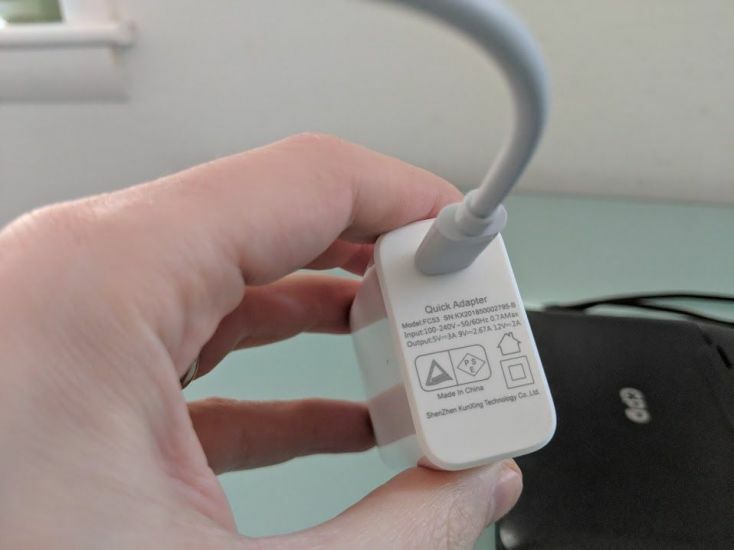 While there’s a microphone that you can use to record voice memos or talk to Cortana, if you want to make video recordings or participate in a video conference call, you’re going to want to plug in a USB camera. There’s also no touchscreen, which isn’t all that odd for a laptop. But it does seem like a strange omission on a handheld device with a 6 inch display. 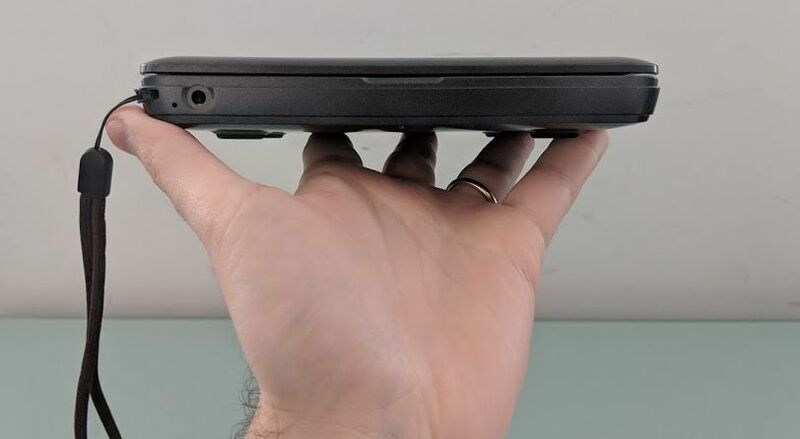 We’ve become so accustomed to reaching out and touching screens of this size that it’s a bit disconcerting at first to realize that nothing happens when you touch the GPD MicroPC’s display. But once you learn to resist that urge, it’s pretty easy to navigate using the keyboard and touchpad. 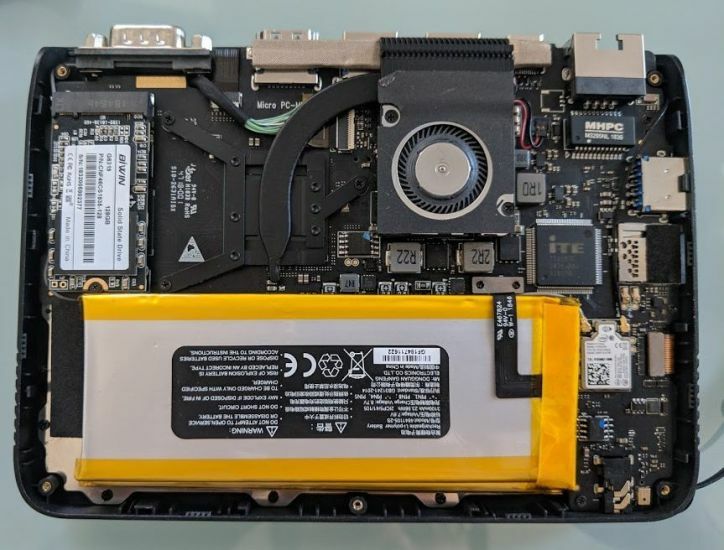 Under the hood, the system is powered by an Intel Celeron N4100 quad-core Gemini Lake processor. 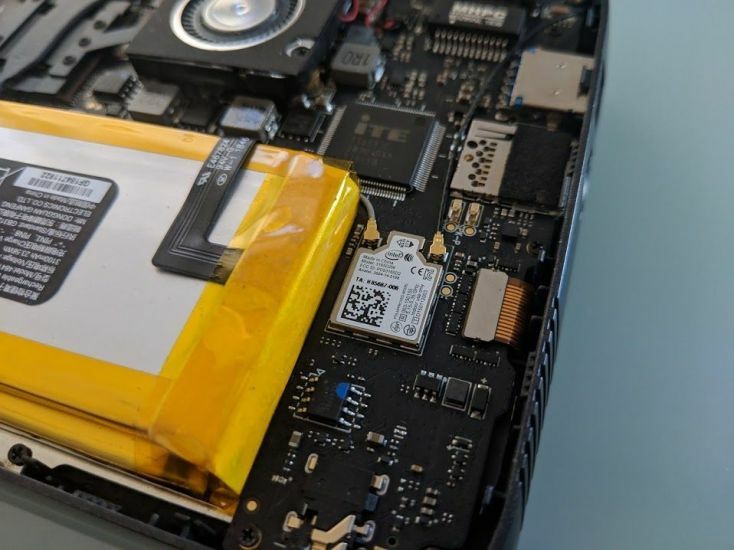 It’s not a super-speedy processor, but GPD has adjusted the system settings so that the chip can run at up to 10 watts instead of maxing out at 6 watts. That brings a bit of a performance boost over other devices with the same chip, although it may reduce battery life if you’re running resource-intensive applications (like some games). The computer can be used with active or passive cooling. There’s a fan switch above the center of the keyboard that lets you toggle the fan. When it’s running, it helps keep the system cooler which could help prevent CPU throttling in some situations. But the fan also emits a noticeable high-pitching whining noise, so if you’re in a quiet room and don’t mind sacrificing a little performance for some peace and quiet, you can turn it off. Honestly, I haven’t seen much difference in performance with the fan disabled, although the computer does get a little warmer when it’s off. The system has 4GB of LPDDR4 RAM soldered to the motherboard, and a 128GB M.2 SSD that’s user replaceable — although you will have to remove five tiny screws and pry off the bottom of the computer’s case in order to get at it, and that’s not particularly easy to do (unless you have a decent set of computer opening tools that let you pry open the plastic latches holding the bottom cover in place). Update: GPD has upgraded the RAM. 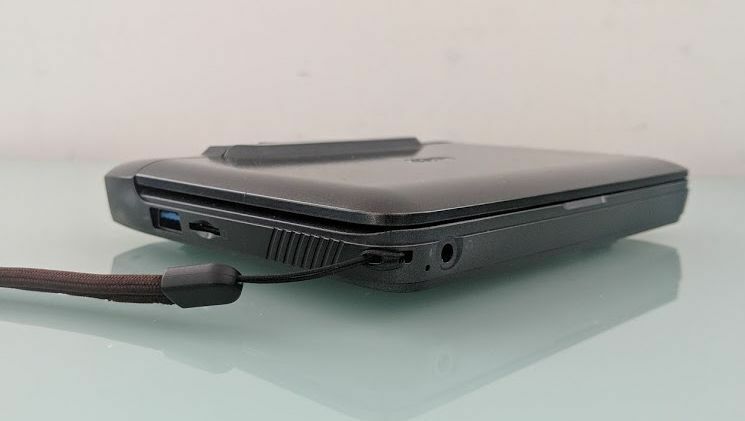 The MicroPC will ship with 6GB instead of 4GB, although the version featured in this review had just 4GB. Inside the case you’ll also see the Intel AC3165 wireless card that enables 802.11ac WiFi and Bluetooth 4.2 connectivity. 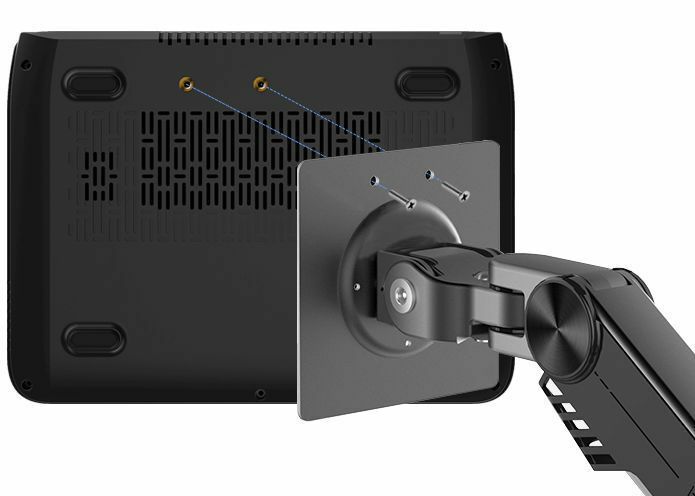 The MicroPC also has two holes in the bottom of the case that you can use to attach it to a stand, bracket, or other mount if you plan to set it up for use in a stationary environment. 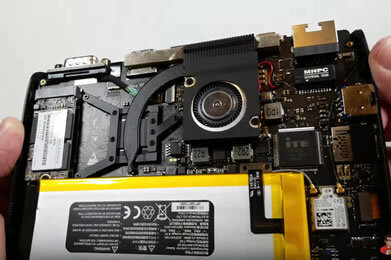 On the front of the computer you’ll find a 3.5mm headphone jack, and on the left side there’s a USB 3.0 Type-A port and a microSD card reader. 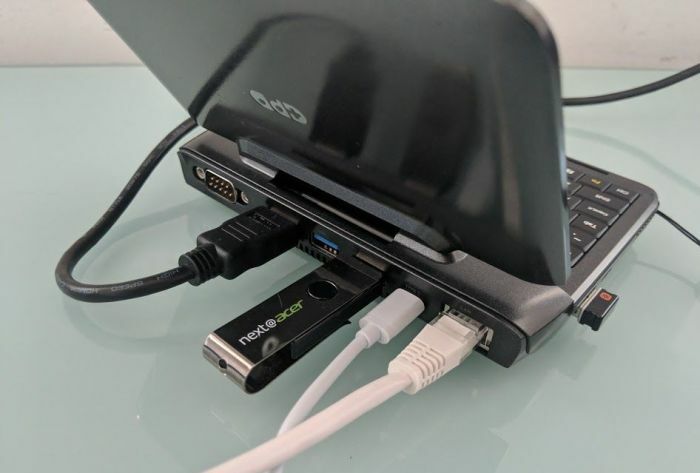 The back of the system has two more USB 3.0 ports, a full-sized Gigabit Ethernet jack, a full-sized HDMI port, and an RS-232 serial port as well as a USB Type-C port that can be used for data and/or charging. 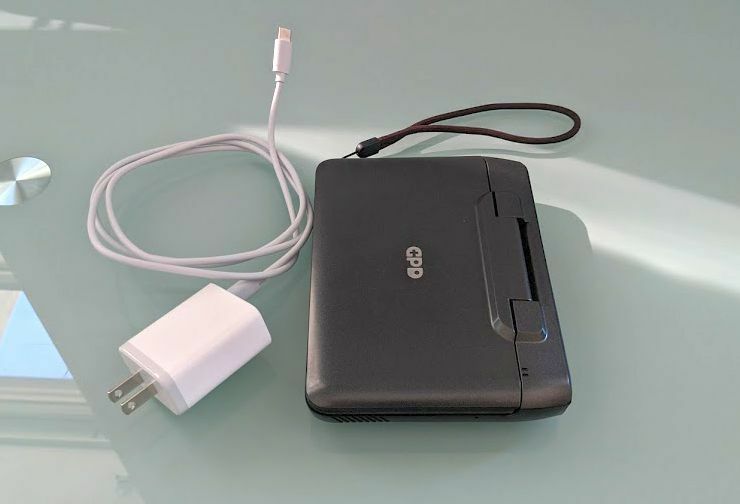 GPD includes a 5V/3A USB-C charger with the system, but I’ve also been able to use the USB-C port to connect the computer to other devices including my phone and the Taihe Gemini touchscreen monitor (the USB connection supplies touch functionality, but the cable I have doesn’t seem to support video output to the display). In terms of raw horsepower, this is one of the least powerful computers I’ve tested in a while. 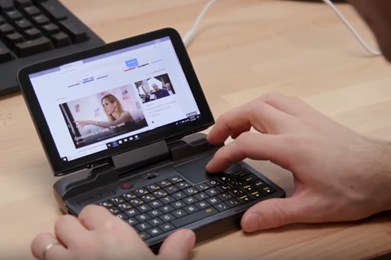 It’s outperformed by the Topjoy Falcon, One Mix 2S, GPD Pocket 2, and GPD Win 2 in most benchmarks. But when it comes to real-world performance, you probably won’t notice much difference unless you’re running really resource-intensive tasks or doing a lot of multitasking. Some games might not run as well, but this isn’t really a device meant for gaming. I mean, I was able to play Psychonauts and Broken Age without any difficulty. But those are older titles. 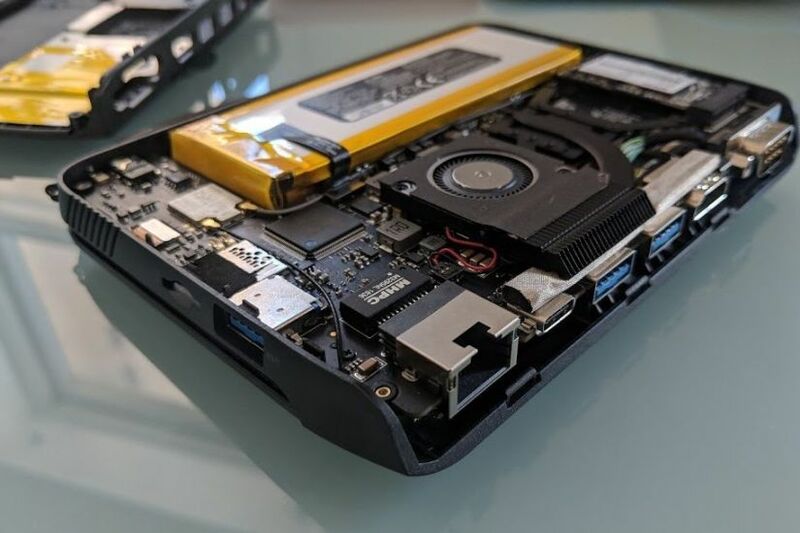 More importantly, when I decided to us the MicroPC to write this review, it was a little slower than my Intel Core i5-8250U powered laptop, but the difference wasn’t big enough to make me want to give up at any point… but I should probably explain how I’m writing this review. When I first got the MicroPC, I tried writing a 300 word article on it. The experience was pretty painful because typing isn’t that easy on the computer’s tiny, stiff keyboard. But it’s not like the computer’s hardware wasn’t up to the task. So when I got ready to write this review, I threw a bunch of accessories in my backpack and headed out to a coffee shop. I’m typing this sentence into WordPress using the MicroPC. But I’m not actually using the computer’s keyboard, touchpad, or display at the moment. Instead I’ve plugged in a Logitech K400 wireless keyboard, a Microsoft Wireless Mobile Mouse 4000, and Taihe Gemini portable 15.6″ monitor. In other words, I’m basically using the MicroPC as a portable desktop computer. I’ve plugged a bunch of peripherals into it so that I don’t have to use the tiny keyboard and display to do a lot of typing… because they’re honestly not really meant for it. The good news is that while writing this review I’ve been able to open more than a dozen Chrome browser tabs, watch videos, edit photos, and write several thousand words. 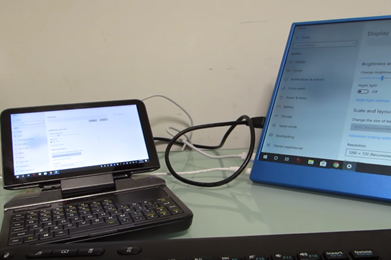 What’s more, turning off the built-in display seems to extend the MicroPC’s battery life a bit, even while it’s sending video to an external 15.6 inch screen (which is running on battery power). The point is, this is a full-fledged, fully capable Windows computer. It’s not a speed demon, but it is fast enough to use for real work. 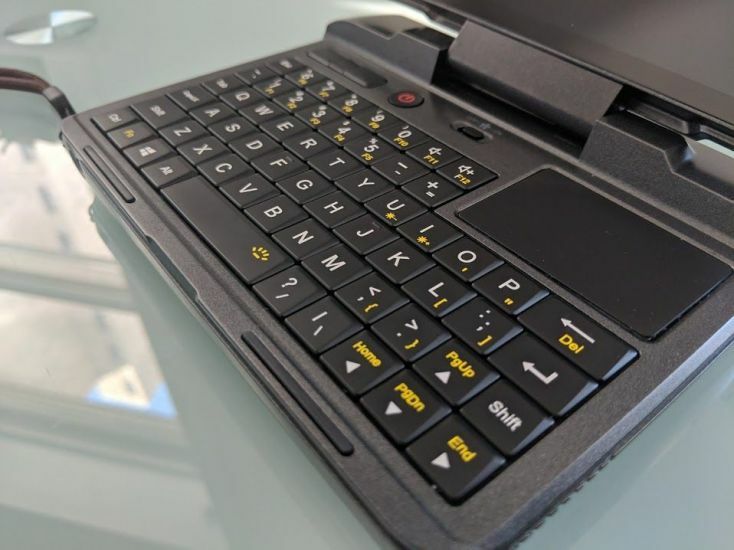 But as I discussed in my GPD MicroPC keyboard test article, the computer’s small keyboard is better suited for entering URLs, usernames and passwords, and brief strings of text than for typing out long articles. I can type at about 100 words per minute on a decent, full-sized keyboard. The best I can do on the GPD MicroPC is about 35 words per minute. Not only are the keys smaller than I’m used to, but they’re also closer together and arranged in an awkward configuration. 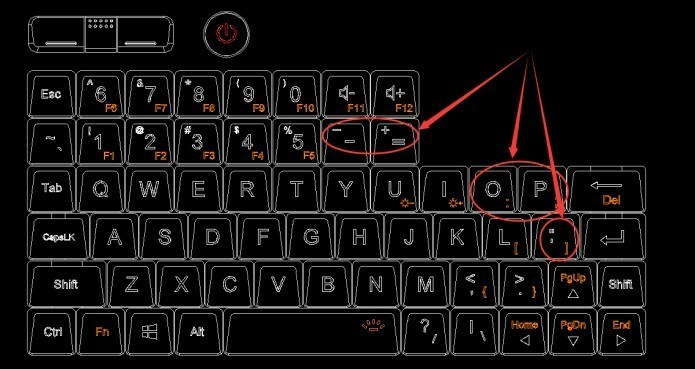 The number keys are all on the left side of the keyboard, in order to make room for the touchpad. That means there’s two rows, with the 6 – 0 keys above the 1-5 keys. And there’s not enough room on the right side of the keyboard for all the characters you’d normally find there, so the quotation mark and apostrophe keys, for instance, are placed in the top row — you have to press Fn + O for apostrophe and Fn +P for quotation mark. It takes me a moment to find those keys almost every time I go looking for them. Long story short, I can’t really touch type on this keyboard. I have to look at my fingers, which increases the chances of typos and decreases my typing speed and accuracy. 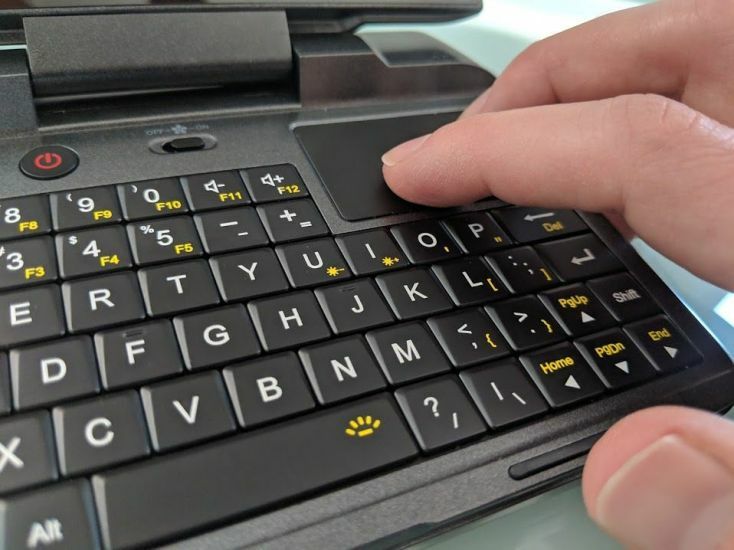 Update 2/20/2019: GPD has announced it’s updating the keyboard design. The quotation mark and apostrophe are moving down to the key that was formerly used by the colon and semi-colon, to the left of the L key. This is a much better location that should make these frequently-used keys a lot easier to find. The colon and semicolon, meanwhile, are moving up to the O and P keys. And the — and + keys have been switched so that pressing them now gives you – or =. You can still enter a — or + character by holding down the Shift key when you press one of those buttons. You also have to push the keys rather hard, so my fingers get tired if I spend more than a minute at a time typing. Fortunately, there are a lot of things you may want to use a computer for that don’t involve much typing. 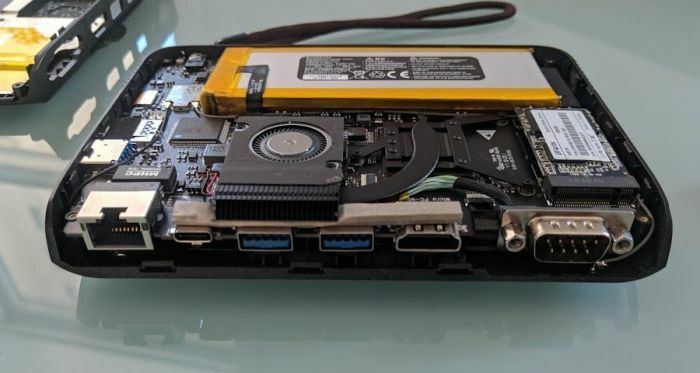 The MicroPC has no problem playing videos. You can use it to surf the web. Some light gaming isn’t out of the question. And as I’ve mentioned, IT workers could use it for all sorts of testing and troubleshooting on the go. 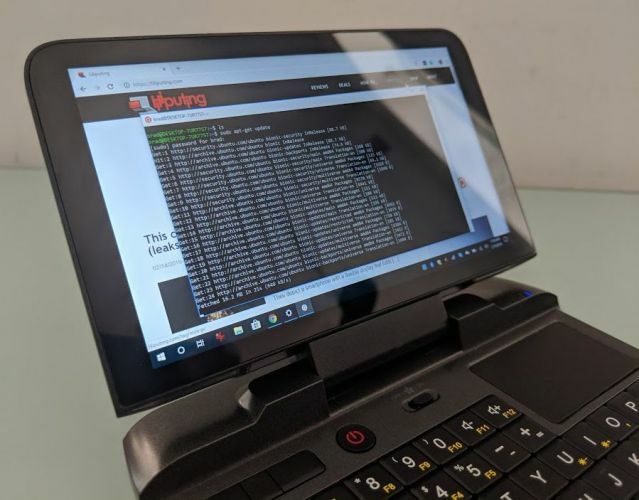 While some folks would undoubtedly prefer to do that sort of working using Linux, the MicroPC ships with Windows 10 Pro. When I tried to boot Ubuntu from a USB flash drive, I ran into some problems. For example, the screen was stuck in portrait orientation and there was no obvious way to rotate it (the usual “xrandr -o right” command didn’t work). I did try a few other GNU/Linux distributions, but didn’t have much luck with any others. 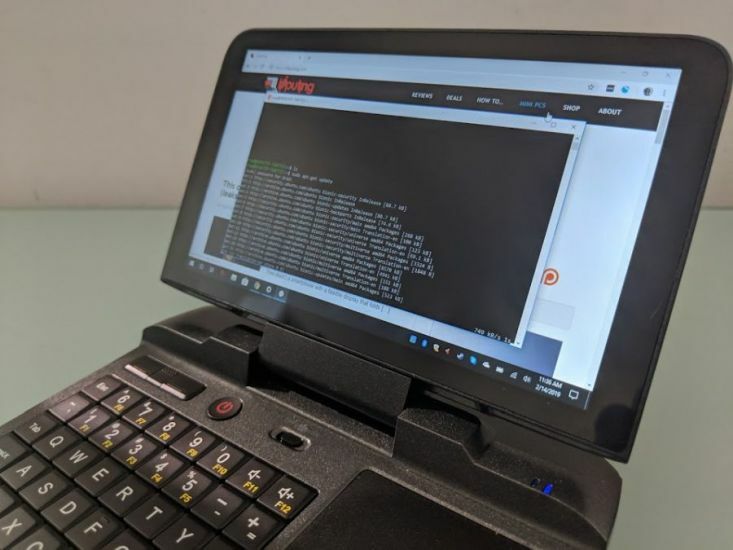 I suspect someone will eventually find a way to improve Linux support, but for now the easiest way to run Linux software on the MicroPC is probably to use the Windows Subsystem for Linux. It took me just a few minutes to enable the feature and install Ubuntu and then I was able to open a Bash Shell and use Linux commands and programs. Since I’m not a network administrator or someone with decades-old computer hardware lying around, I didn’t have much use for the RS-232 COM port on the MicroPC. But YouTuber The Phawx also has a pre-release MicroPC, and he put together a video showing how useful that port could be for some folks. 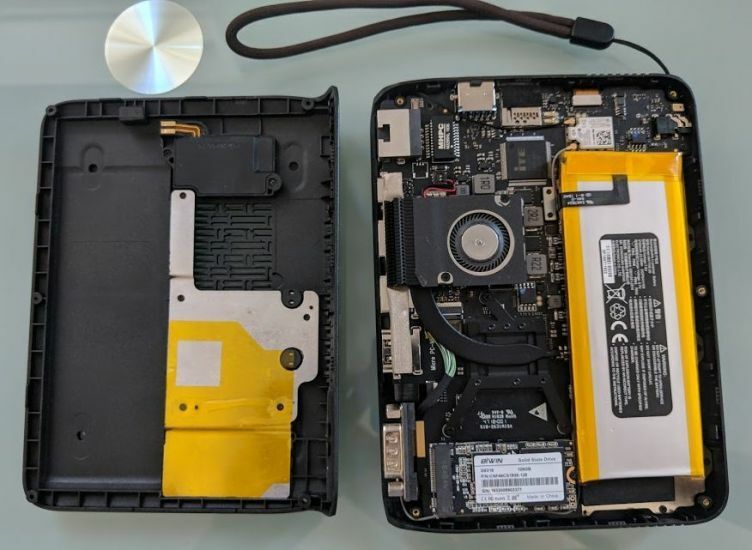 The MicroPC has a 23.56 Wh battery that GPD says should be good for about 6 to 8 hours. That seems a little optimistic in my experience, but not entirely outside of the realm of possibility. Battery life is kind of tough to measure on a device like this, because it’s going to vary pretty widely depending on how you’re using the MicroPC. 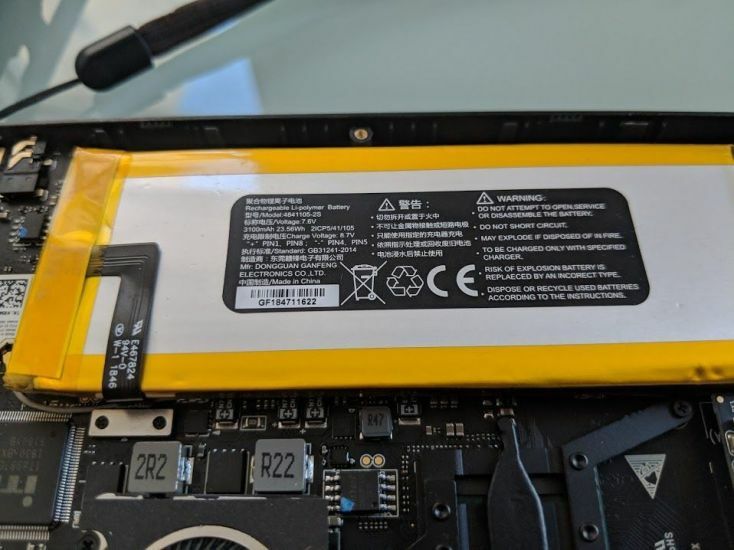 Normally in a laptop review I’d give you a rough estimate by taking a fully charged laptop and then using it all day for work until the battery died. 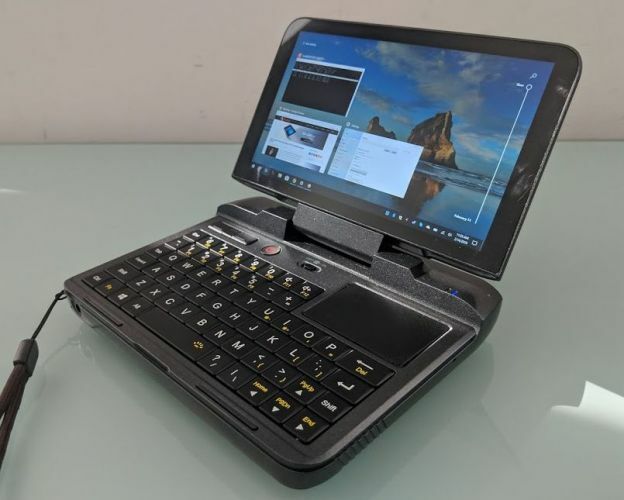 But as I’ve mentioned, that’s not really something I’d subject myself to on a device with a keyboard like the GPD MicroPC’s. 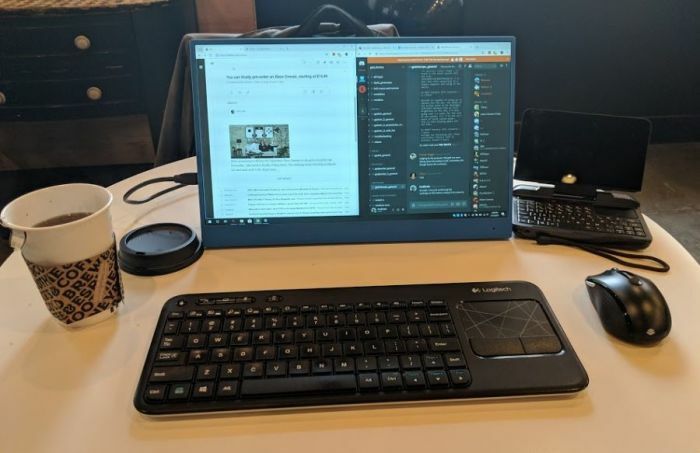 If this were a tablet review, I might get a sense of how long it would run if I were using it to play videos, surf the web, play games, and maybe read eBooks. 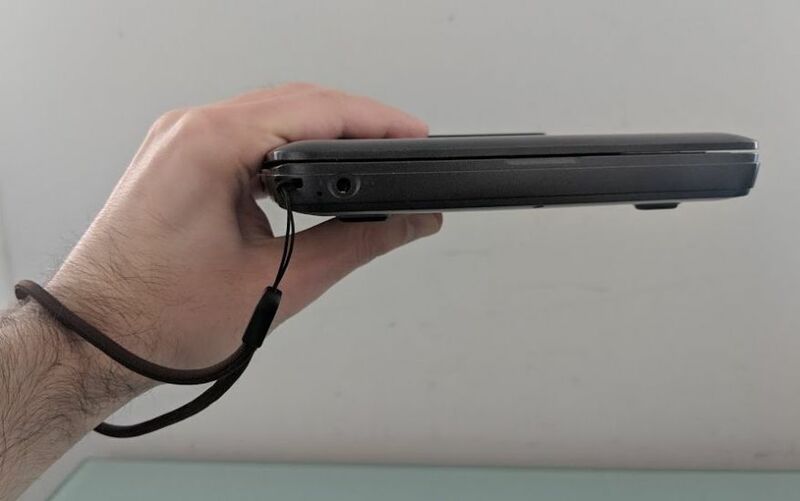 But while I’ve done some of those things with the MicroPC, it’s not really a tablet and there are probably better device to buy if those are the features you’re looking for. So here’s what I’ll say about battery life. As I write this review, with an external mouse, keyboard, and display connected to the MicroPC, Windows is telling me that I’ve got four hours of battery life left… and I’ve been using the computer for almost three hours at this point. But keep in mind that while I’m doing some heavy-duty multitasking, I’ve also turned off the display on the computer itself. When I spent an hour playing Broken Age on the computer a week or two ago, the battery was depleted much more quickly, leading me to believe that I’d get maybe 3-4 hours of run time if I were using it exclusively as a handheld gaming computer (for games that aren’t all that resource-intensive). You can also probably extend battery life and/or improve performance by adjusting the Windows 10 Power Mode settings by tapping the battery indicator and then adjusting the slider. So battery life? It depends on how you’re using the computer. 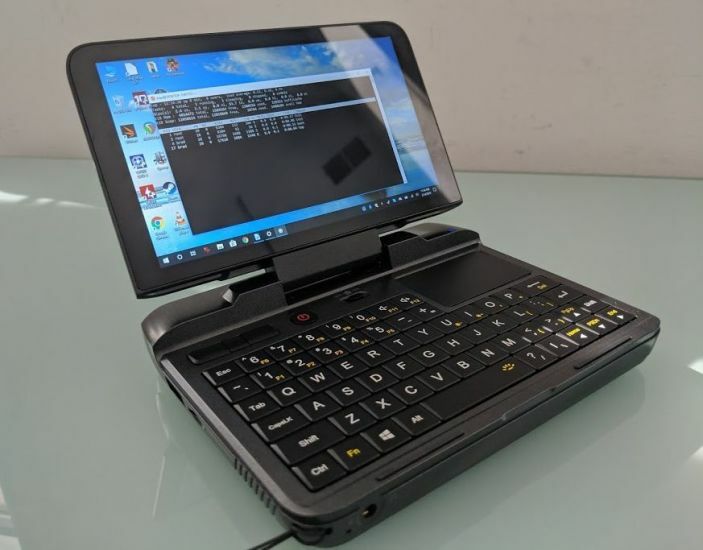 The MicroPC is GPD’s most affordable handheld Windows computer to date. It’s a versatile little device that can run most Windows applications you’re likely to want to run on a system this small. With a backlit keyboard, a fan toggle, a more ports than you’ll find on most 13 inch laptops these days, it’s kind of a geek’s dream. 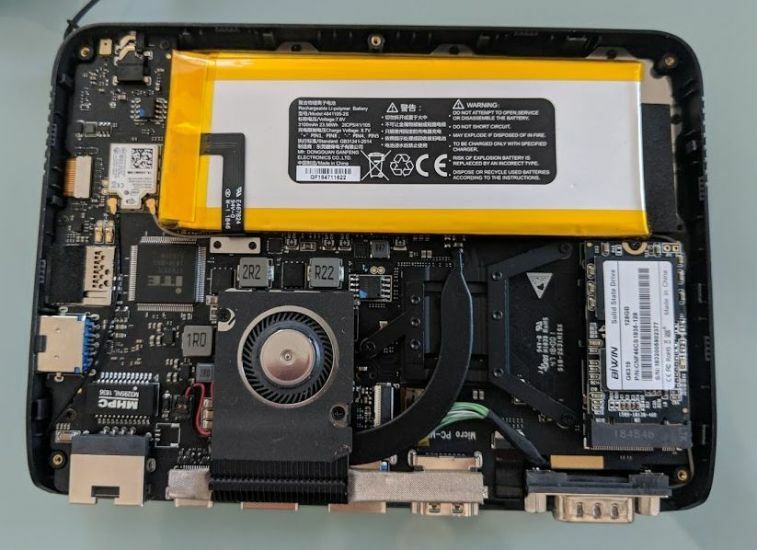 But it’s also a relatively low-power system that’s not going to be a speed demon if you throw heavy-duty tasks at it, like running virtual machines or playing bleeding edge games. It’s not the easiest device in the world to type on. And the lack of a touchscreen or webcam may be a turnoff for some potential customers. 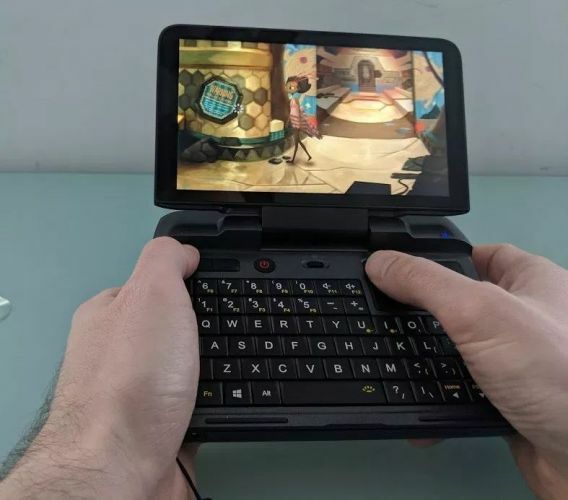 I’d say if you’re looking for a handheld computer for gaming, you’re probably better off with the GPD Win 2 with its stronger processor and dedicated gaming controllers. 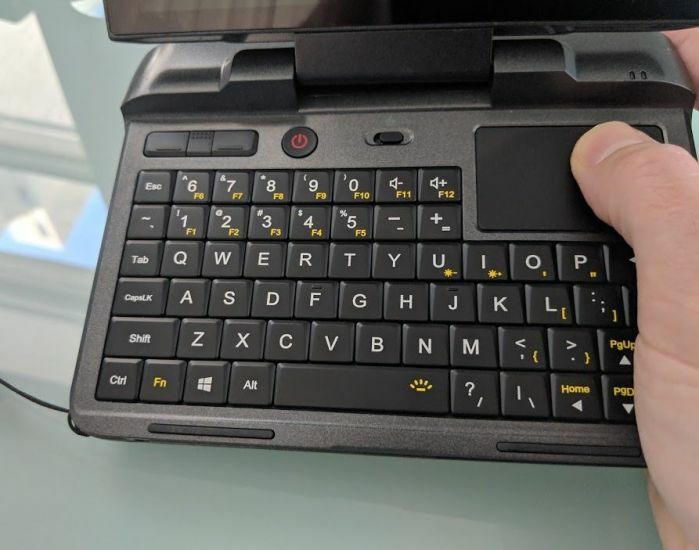 And if you’re looking for a machine with a better keyboard that you can use for touch typing (rather than thumb typing), the GPD Pocket 2 is still the best option. But both of those devices cost up to twice as much as the MicroPC. And they have fewer ports. So I can definitely see why the MicroPC has generated a lot of pre-release buzz. 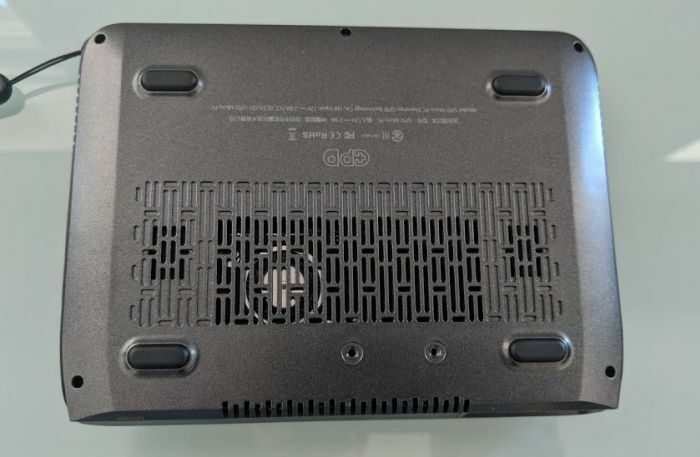 GPD only expects to have enough components to make about 2,000 units in its first batch. If you don’t reserve one during the company’s crowdfunding campaign, you may have to wait until this summer before the MicroPC is available for general purchase. 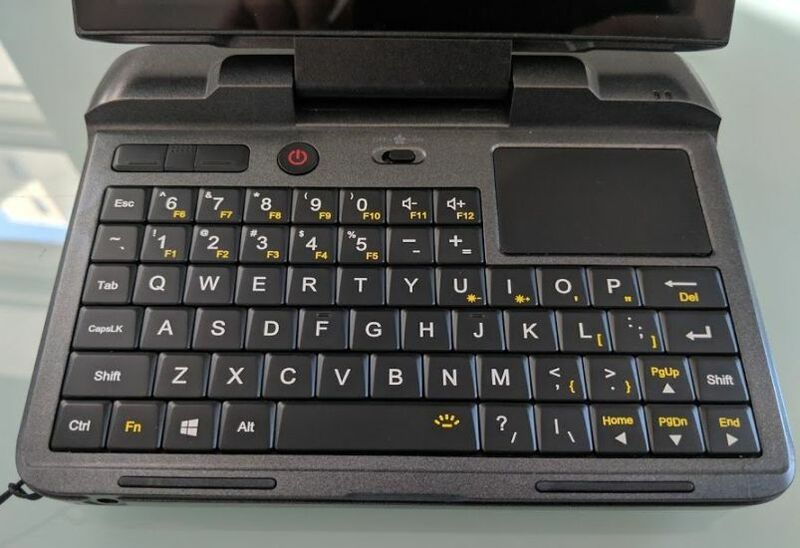 GPD MicroPC - Unboxing and Quick Impressions.